mTrip is proud to announce that out of over 8000 entries submitted, we have been selected as an Official Honoree for the 16th Annual Webby Awards! For those who are unfamiliar with The Webby Awards, they are the “Oscars of the internet” and receive nearly 10,000 entries every year. 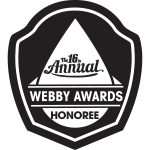 Since 1996 the Webby’s have awarding web excellence for websites, online film, video and mobile content. This year (2012) fewer than 10% of entries were distinguished as an Official Honoree and mTrip Travel Guides is just one of just eight (and the only travel guide) to be selected in the Travel section of Mobile and Apps. Other Official Honorees include Disneyland and National Geographic. The mTrip Team would like to thank all of our partners and mTrip travelers who encouraged us and allowed us to improve our guides over time through their comments and suggestions. Time to trade in your Travel Guide for a Phone App?